How To Write "Compelling" Copy When You Don't Have An Audience. How To Write “Compelling” Copy When You Don’t Have An Audience. Wondering how to write “compelling” copy? Consider this. According to a 2012 psychological study conducted in France by psychologist Remi Radel, humans can perceive the meaning of words in as little as 1/300th of a second. Researchers recruited students for the test, asking all of them to arrive at the lab without having eaten for at least 3 or 4 hours. Half of the students were told there would be a delay of an hour and to eat lunch. The other half had only a 10 minute delay before the start of the test – and given no chance to eat. 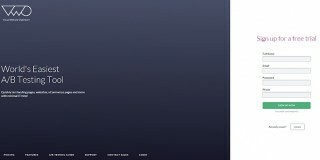 Placed in front of a computer screen, each student watched as 80 words (1/4 of them food related) were flashed for no more than 1/300th of a second each in a font size just large enough to be consciously perceived. After each word flashed, the students were given two choices of words to look at and asked to pick out the one they had seen and give an indication of how bright it was. Even though the words appeared too briefly for the students to be able to read them, the hungry people identified the food related words better and claimed they appeared brighter. 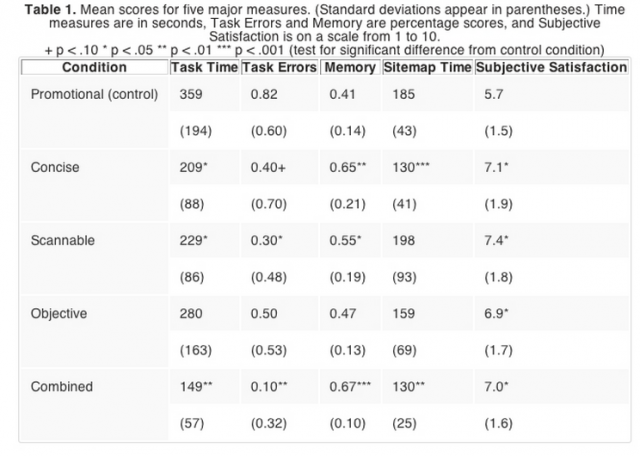 The interesting takeaway from this study is that on an instinctual level, humans can make a distinction between what they need at any given moment and what they don’t without having to go through a higher level of mental processing. The reality is that most people don’t read on the web. They scan. Based on research done by the Nielsen Group, 79% of their test users scanned any new page they came across with only 16% reading word by word. Results from a Nielsen Group study on scannable text. As it applies to the web, you’ll be able to increase your chances of satisfying whatever your visitors are hungry for by providing them with easily digestible chunks of information in the words that resonate most. The key is to find the words that tap into those instinctual needs of your target audience and place them where they will be seen. So, where do you start? Do You Really Know What Your Target Market Cares About? For startups and fledgling businesses without a wealth of customer surveys to pull their messaging from (or even established businesses looking to find a new angle), trying to develop effective copy for their sites and landing pages can be a daunting task – if not downright overwhelming. As Peep notes above, you need to understand what makes your potential customers tick, what’s rattling around in their brains – good and bad. This doesn’t simply mean having a general idea of what they want. Being able to integrate the words they use to describe products or services similar to yours will tap into that part of the brain (otherwise known as the amygdala) responsible for getting them what they need. Additional recent studies in animals and humans have found the amygdala, commonly associated with the part of the brain hardwired for primitive threat avoidance and emotional response, may play an important role in guiding choice. So, what should you do if you’ve got to write copy but have no idea where to start? 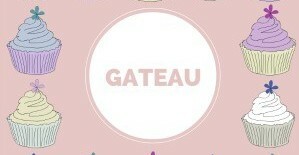 I’ll let you in on a little secret. 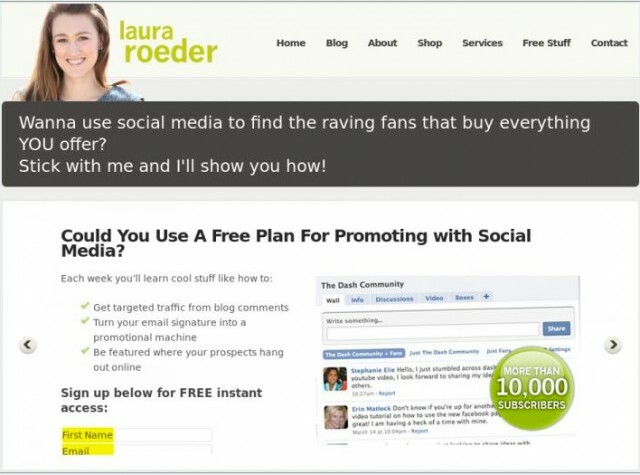 It’s a process for mining key phrases straight from the mouth of your target audience that I learned directly from the “conversion copywriter” herself, Joanna Wiebe of Copyhackers. She’s written about it on a number of occasions with this post on Kissmetrics giving the most thorough rundown of her process. And, the process has been an indispensable tool for me in putting together copy for multiple landing pages. Even if you have yet to conduct phone interviews or launch survey questions via your website or by email, you may have a collection of testimonials that can be mined. Let’s say your business has only been up and running for a relatively short time. You’re just starting to get feedback on Twitter, comments on your Facebook page, even words of praise by email that you’ve been stockpiling to add as testimonials on your site. Start making a running list of them. 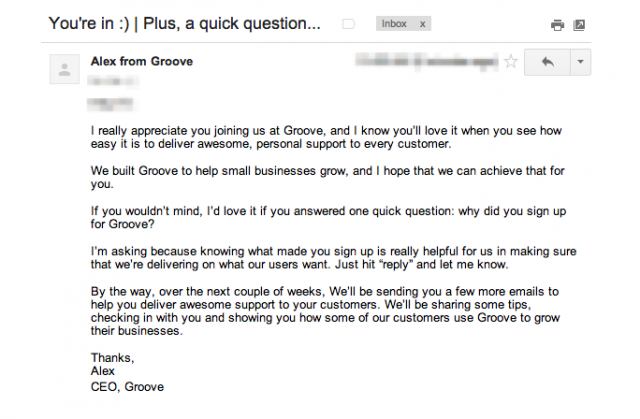 For example, the company GrooveHQ took advantage of using it’s welcome email to trial customers to ask why they signed up. With a 41% response rate, they got phenomenal feedback about their product to use for their messaging down the road. Also, there may even be words worth lifting about you for your copy you’re not aware of yet. Make sure you’re doing relevant searches for your business, services or products, on places like Mention.com and the various social networks. It may not seem like a lot but your next great headline might be hidden there. 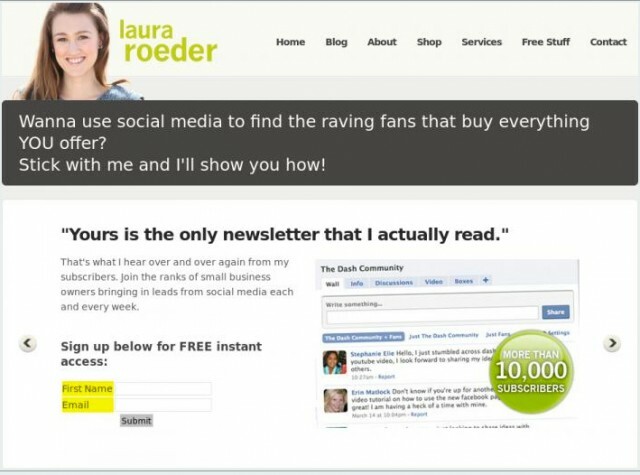 Laura Roeder of LKR Social Media ran an A/B test using Visual Website Optimizer on her homepage to see if changing the sub-headline copy directing visitors to sign up for her newsletter would better conversions. She chose to use words taken directly from a testimonial. After 12 days of letting the test run, signups increased by 24.31% with a confidence level of 97%. The folks over at Copyhackers conducted a similar copy test where they changed the headline and clarified the sub-head in the hopes of increasing clicks from a SaaS company’s landing page to its Plans and Pricing page. 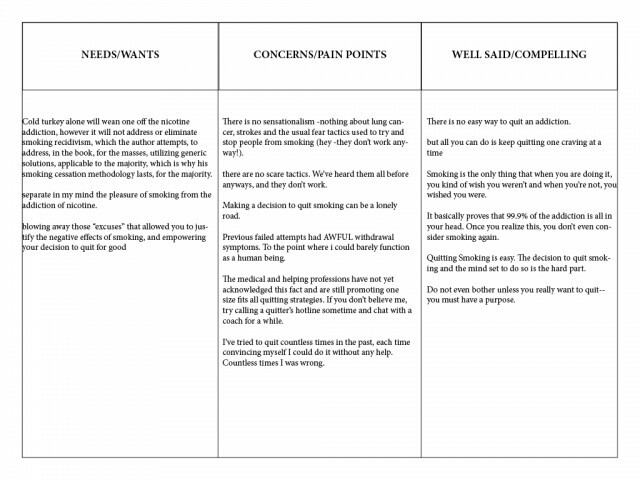 By reworking the copy found in a testimonial on the company’s site, they were able to more than double conversions. See how pulling a key phrase that speaks to a real benefit in a customer’s or prospect’s eyes can be woven into the copy? The headline above beat 3 other variations and the control all written without customer of voice data. You have no customers yet? Or, you want to supplement the feedback you do have to get a better picture of what your prospects need, care and are concerned about? No problem. 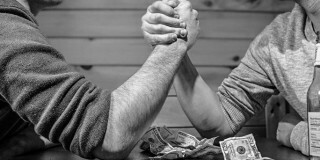 With a little competitive analysis you can create compelling copy, especially if what you sell isn’t unique. Where you go depends on the product or service you’re selling. You’re developing a new app to help people locate dog parks around the country. Spend time on iTunes and Google Play looking at reviews of similar apps. Check out reviews of books about dog walking or dog parks on Amazon. You’ve created a line of organic household cleaning products. Look for book reviews about how to make non-toxic cleaners and comparable product reviews. You just started marketing a new line of sunscreen for children. Beyond researching reviews of comparable products, see how parents talk about the subject in different forums like Facebook groups. What are the biggest problems they face finding a sunscreen they feel comfortable using. Writing effective copy based on your online research starts with pulling the best snippets of the reviews or testimonials you’ve found. The kinds of phrases you’re looking for are ones that tap into people’s desires, concerns or pain points. Finally, you start crafting the message based on what your prospects have said. 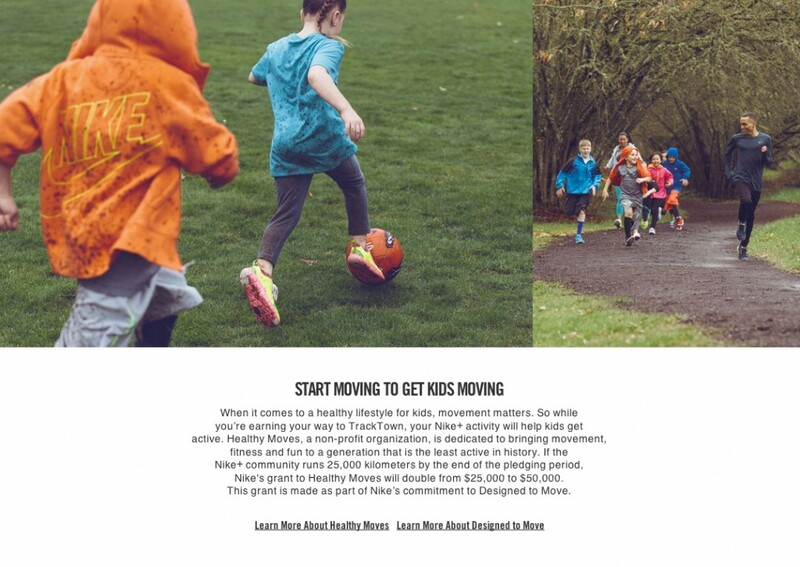 Let’s take an existing landing page that needs some help with its headline and adjust the copy based on some detective work online to see what potential customers are thinking. 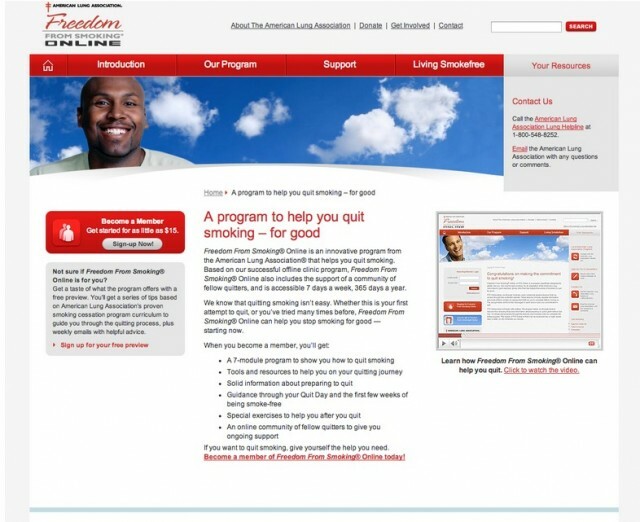 The above landing page is for an online smoking cessation course from the American Lung Association. Knowing that smoking cessation programs have fairly low success rates and that only 4-7% of people are able to quit smoking without medicines or help at any one time, framing the messaging correctly to make an impact is critical. We’re dealing with prospects who may well be jaded after multiple attempts at quitting. Looking at customer reviews for books about how to stop smoking along with associated products will be able to shed light on this assumption. 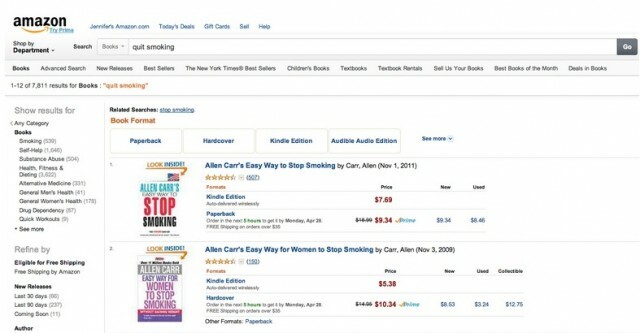 The first two books that come up in a search for “quit smoking” on Amazon are by the same author – with the first having over 500 reviews. Click on the first book and start reading the reviews, one by one. The same can be done for reviews of products that relate to smoking cessation. Here is a review of the Nicoderm patch. Put together a spreadsheet, Word or Google document and divide it into these three categories. From there, start copying and pasting the bits of any reviews that stand out – placing them under each category. Here are lists I started after rummaging through the book and product reviews. Click here to access Google Doc. How do we motivate a group of prospects to sign up for an online course designed to help them kick a habit that is notoriously difficult to do? The first thing to consider is framing the copy so that it matches how the prospect thinks about his goal. We already know from the customer review phrases pulled that smokers looking to quit don’t respond well to scare tactics. This is where taking a cue from psychological studies about goal pursuit – in particular the idea of Regulatory Focus– can help. To make the strongest appeal, it helps to know if your prospects respond better to what’s considered messages that are “Prevention” focused or “Promotion” focused. While the customer reviews suggest that quitting is difficult and may take several tries, keying into messaging that speaks to the positive or potential achievement of no longer smoking will increase motivation. From the Nicoderm patch review, there’s a highly compelling sentence near the end worth lifting. The headline and sub-headline acknowledge the reality of failure but redirect it with a positive spin. The best part is that the key phrasing comes straight from the prospect’s mouth. “Habit” and “addiction” are words used over and over again throughout the product and book reviews. Finding this little gem of a sentence in one of the reviews, has made my job of writing copy geared to the prospect a whole lot easier. Go through a minimum of 10 reviews. Certain types of products and services are difficult to find multiple comparable reviews for, but aim to get snippets from at least 10 if possible. Harvest multiple types of reviews. Don’t limit yourself to book reviews if Yelp can be tapped as well. Test, test, and keep testing. Remember, even though you’ll be creating copy based on your prospect’s voice, you’re still going on an assumption of what will convert best. Keep tabs on your data. It’s the only way to know for sure how to improve your results. Next time you get stumped writing copy for one of your landing pages, give this technique a try. It might just make your job a whole lot easier. Great post Jennifer. Will definitely share this with our copywriter. I am sure he will love what you’ve written. Thank you so much! Glad it was helpful. Excellent post Jennifer, thanks so much for it. I loved your explanation about how to mine others’ great copy! Great! Check out that post on Kissmetrics by Joanna at Copyhackers too. As I said, she taught me. Learned from the best. I keep seeing the word pizza. Me too! But, I love pizza. Thanks Jennifer, to further detail on reading peoples mind. I want to add that also going to forums and answers sites as quora can really deeping your insights as well. Great idea, Peter. Yes, sites like that can be really helpful too. Just look for real reviews from actual customers. Stay away from pro review sites as they aren’t coming from the voice of customer. Jen, how do you avoid missing the hidden motivations customers don’t openly talk about online? It’s tough when what you’re working with is extracted from third party reviews. I think the point here is to give you a better place to start with your copy, especially when you don’t have any of your own customer research to draw on. This is where testing and reevaluating as your customer base grows is critical. Your copy will always be evolving, just like your site. This is one of the best most actionable articles I have read. Not only is the information incredibly helpful, you illustrate the power of the learn-teach-learn process. You learned from Johanna at copyhackers and passed on your learning (teaching) to others. I have learned from you and I am sharing this with everyone in our marketing organization. Thank you so much! I really appreciate that. Yes, it’s such a useful tool and worth sharing. Plus, it’s something that I’ve expanded on in my own business – finding unique ways to apply the concept when I’ve been faced with a project that isn’t straight forward. Let us know how it’s received. Except this study, I agree with everything. Very good article. I created the animation as an example of how fast 1/300th of a second is, not necessarily as an exact replica of the study cited. OMG this was the best article on creating copy – and even content – for an audience you don’t have an official scope of. I learned so much, and had so many AHA! moments taking in the points. I love the concept of data mining reviews and content from the audience to lift for copy-tweaking purposes. That should be “obvious,” considering my experience in writing, but it’s not. With that said, I’m mixing in a few ideas of my own and going to experiment with this for content development. I’m so glad you found this helpful! It is a nifty tool, especially when you’re stuck and need to understand the customer’s needs and voice. Have fun with it. Excellent post, Jennifer. Too often writers mine information from the client only. There’s no better way to really understand the “hot points” than to research what their clients are saying. Thank you so much. I’m really glad it resonated with you. I’m always looking for ways to create more effective copy. 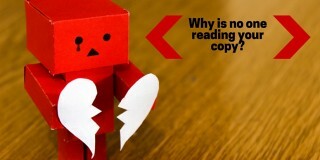 An excellent post with really good ideas to find copy that will convert. Thanks, Jennifer. You’re welcome. So glad you found it useful. Really helpful post and excellent examples. It totally makes sense to look out for the “real language” people speak – and then use it effectively to adress their needs in words that they can relate to. Thanks for sharing!